Rosenbergs Trial: An Account of the Trial with links. The Rosenberg Trial is the sum of many stories: a story of betrayal, a love story, a spy story, a story of a family torn apart, and a story of government overreaching. As is the case with many famous trials, it is also the story of a particular time: the early 1950's with its cold war tensions and headlines dominated by Senator Joseph McCarthy and his demagogic tactics. The Manhattan Project was the name given to the top-secret effort of Allied scientists to develop an atomic bomb. One of the Manhattan Project scientists working in Los Alamos was a British physicist named Klaus Fuchs. Twice in 1945 Fuchs met with a Soviet agent named Raymond and provided notes on the working design for the atomic bomb. In February 1950, less than two weeks after a jury convicted Alger Hiss of perjury for denying under oath that he had passed secret information to a Communist agent named Whittaker Chambers, Klaus Fuchs was arrested and confessed to disclosing to the Soviets information about the Manhattan Project. One week after Fuchs' arrest, Senator Joseph McCarthy from Wisconsin propelled himself into the headlines by charging that the State Department employed over 200 Communist agents. It was a bad time to be a suspected Communist; it was a terrible time to be a suspected spy. Fuchs' arrest, which began the chain of investigations that led authorities to Julius and Ethel Rosenberg, was made possible by American cryptanalysts who successfully deciphered intercepted cables (the "Venona Cables") from the Soviet Consulate to the KGB. One cable was a report by Fuchs on the progress of the Manhattan Project. When confronted with evidence of his espionage, Klaus confessed and told authorities of his meetings with a spy he knew only as "Raymond." Within three months, the FBI began to focus on a pudgy, middle-aged chemist, Harry Gold, as the "Raymond" to whom Fuchs had given information about the bomb. Within a week after the FBI first began to ask Gold questions such as "Were you ever west of the Mississippi?," Gold offered a voluntary confession. By June 1, authorities knew of a soldier, stationed at Los Alamos, married with no children, who Gold paid $500 to in September of 1945 in Albuquerque in exchange for information about the implosion lens for the atomic bomb. Gold could not remember the soldier's name, but thought his wife "may have been Ruth" and that he was a New York City native. Within two days, Gold was shown a picture of a man meeting the description he had given. The man pictured was David Greenglass. Gold told investigators that Greenglass "resembled" the man he met in New Mexico. 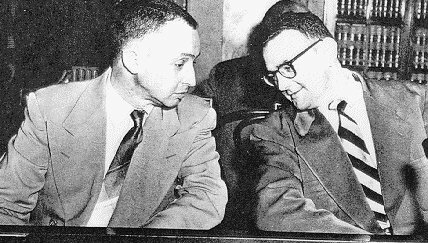 On June 15, 1950, FBI officials questioned David Greenglass. In his first interview, Greenglass admitted that he was the machinist-soldier stationed in Los Alamos that had passed information to Gold. He also identified his wife, Ruth, and his brother-in-law, Julius Rosenberg, as participants in the Soviet spy ring. Julius Rosenberg was the son of a Polish garment worker living on New York's Lower East Side. Julius was a quiet, serious youth whose early success in Hebrew studies led his father to hope that he might become a rabbi. By his senior year in high school, however, it was clear that Julius' passion was for politics, not religious studies. Julius, at age 16, was a doctrinaire member of New York City College's Young Communist League. He met Ethel, three years his elder, at a union fund-raising party and the couple was married in 1939 when Julius graduated with an engineering degree. In the fall of 1940, he took a job as a civilian employee of the U. S. Army Signal Corps. In 1943 the Soviet Union was, of course, America's wartime ally. Hollywood, with the blessing of the U. S. government, was producing movies such as Mission to Moscow and Song of Russia that depicted life in the Soviet Union in a Utopian way. Even such conservative figures as General Douglas MacArthur and Winston Churchill were producing a steady stream of praise for the Soviet Union's heroic efforts against the Nazi forces. In such times, it is easy to understand how idealistic and avidly pro-Communist young people such as Julius Rosenberg and David Greenglass might be tempted to provide the Soviet Union with secret information that might be helpful to their cause. Late in 1943, according to Greenglass, Rosenberg began to talk to him in abstract terms about espionage. These conversations coincided with the Rosenbergs dropping out of the open Communist Party activities that had been a large part of their lives. Greenglass would suggest that the decision to drop out of the Party was a necessary consequence of the Rosenberg's decision to undertake espionage work for the Soviet Union. The Rosenbergs, of course, had a different explanation: that they wanted to have more time at home after the birth of their first child earlier that year. According to Greenglass, Julius Rosenberg was tremendously excited when, in 1944, David was assigned to work as a soldier-machinist in Los Alamos. Greenglass told the FBI that Rosenberg asked his wife, Ruth, to talk with him in Albuquerque to see if he might be willing to provide descriptions of Manhattan Project research. David described his decision to accede to his brother-in-law's request as "like plunging into a cold lake. "(1) But plunge he did. Over the course of the next year, David prepared handwritten notes and sketches relating to a high-explosive lens mold being developed in a Los Alamos laboratory . These notes were, according to Greenglass, either passed directly to Rosenberg while he was on furlough in New York, or to a courier (Harry Gold) sent to New Mexico to collect the information. Greenglass told the FBI that Julius Rosenberg had become alarmed when, in October of 1949, he learned through Soviet intelligence that American authorities had information that might lead them to Los Alamos spy Klaus Fuchs and, potentially, to Gold and Greenglass as well. According to Greenglass, Rosenberg urged him to obtain U. S. passports as soon as possible and prepare to flee to Europe. After Fuchs' arrest, Rosenberg's urgings became more insistent. David's decision to reject his brother-in-law's advice was due largely to the condition of his wife, Ruth, who was six months pregnant and still recovering being critically burned in an apartment fire. Shortly after 8 a.m. on June 16, 1950, FBI agents showed up at the apartment of Julius Rosenberg and asked that he accompany him for questioning. To the FBI at the time, Julius was "just the next in a row of falling dominoes"(2)--but unlike the dominoes in line before him, Julius did not tip over. When informed of Greenglass's accusations, Rosenberg said to FBI agents, "Bring him here-- I'll call him a liar to his face." That evening Julius hired the attorney who would fight to the night of their deaths to save the Rosenbergs, Emanuel Bloch. Whatever hopes Rosenberg had that Greenglass would withhold from the FBI the additional details of his espionage activities necessary to establish a basis for arrest were dashed by mid-July. On the basis of more complete statements by both Ruth and David, two agents showed up on the evening of July 17, 1950 to clap handcuffs on Rosenberg in the view of both his sons. As he was hustled out of his apartment, a backup team entered his apartment to conduct a sweeping search for incriminating evidence. The primary interest of the FBI in Ethel Rosenberg in July of 1950, lay in the possibility of threatening her with prosecution as a means of convincing Julius to talk. The case against Ethel was very weak. It rested entirely on the testimony of the Greenglasses, who described her as present at the time certain conversations about espionage took place and identified her as typing notes on classified information. J. Edgar Hoover urged his Bureau employees to aggressively attempt to build a triable case against Ethel: "There is no question" but that "if Julius Rosenberg would furnish details of his extensive espionage activities, it would be possible to proceed against other individuals . [P]roceeding against his wife might serve as a lever in this matter. "(4) Though holding remarkably limited evidence of her guilt, the FBI arrested Ethel on August 11, 1950, as she walked to catch a subway after testifying before a grand jury. Ethel was imprisoned immediately, denied even the opportunity to return home to arrange care for her two sons, who had been spending the afternoon with a neighbor. Weeks after beginning life in the Women's House of Detention, Ethel began to adjust to prison life. Julius, meanwhile, gave no indication that his wife's threatened prosecution would cause him to reconsider his refusal to cooperate with authorities. The lever wasn't working, and now the Government was committed to the prosecution of Ethel as an equal partner in the espionage conspiracy. As the FBI was closing in on the Greenglasses and the Rosenbergs, things began to happen to several of Julius's acquaintances who shared his enthusiasm for leftist politics. Joel Barr, a college friend of Rosenberg, disappeared in Paris on the day Greenglass was arrested, leaving most of his personal possessions behind. Less than a week later, another college friend, Morton Sobell, boarded a plane with his family at La Guardia Airport with tickets for Mexico City. A third Rosenberg friend, Alfred Sarant, managed to elude FBI surveillance at a racetrack and make a successful dash by car to the Mexican border, and then to parts unknown. William Perl, a Cleveland scientist, was called before the Rosenberg grand jury where he denied ever having known Rosenberg. On the basis of that statement and ample evidence to establish its falsity, Perl was indicted for perjury. A fifth Rosenberg acquaintance, Max Elitcher, chose cooperation over flight. Elitcher told FBI investigators that Rosenberg tried to recruit him to espionage work in 1944. Elitcher also described an incident in 1948 when he, along with his friend Morton Sobell, had taken a midnight ride to a deserted waterfront street in New York City in order that Sobell might bring a 35-mm film can to Rosenberg's apartment. Elitcher's story provided the basis for a warrant to arrest Morton Sobell, who the FBI knew to still be in Mexico. On August 16, 1950, after a day spent trying to book passage on a freighter to Europe, Sobell returned to his Mexico City apartment. There he found a band of pistol-waving Mexicans, who forced him into a car, drove him 800 miles to the border, then handed him to waiting FBI agents in Laredo, Texas. Skies were cloudy in New York City on March 6, 1951, when the case of the United States v Julius Rosenberg, Ethel Rosenberg, and Morton Sobell was called for trial. Each defendant was charged with conspiracy to commit espionage, a capital crime. United States Attorney Irving Saypol, famous already for his recent successful prosecution of Alger Hiss, opened for the government. Saypol told the jury that the defendants "have committed the most serious crime which can be committed against the people of this country." The Rosenbergs conspired, Saypol said, to deliver to the Soviet Union "the weapons the Soviet Union could use to destroy us." Emanuel Bloch, in his opening statement, asked the jurors to give the defendants "a fair shake in the American way." He urged the jurors not to "be influenced by any bias or prejudice or hysteria." The only witnesses called by the defense were Julius and Ethel Rosenberg. Sobell chose not to testify. Both Rosenbergs pleaded the Fifth Amendment in response to all questions concerning their membership in the Communist Party, most likely to head off potential questions about other acquaintances who might be members of their spy network. Calling their crime "worse than murder" and blaming them for 50,000 American deaths in Korea, Judge Irving Kaufman sentenced both Julius and Ethel Rosenberg to death in the electric chair. (Link to sentencing statement) Morton Sobell received a thirty-year sentence. The two-year long battle to save the Rosenbergs' lives that followed was the most dramatic chapter of the case. Emanuel Bloch fought heroically on behalf of his clients, taking care of their children, drafting their appeals, pleading at the White House gate in the final hours for a hearing with President Eisenhower. Louis Nizer called Bloch "an advocate in the classic sense, whose 'hands were charged with electricity and his face ablaze with concern for his quivering client'. "(5) Meanwhile, Julius and Ethel rode an emotional roller-coaster of hope and despair (Link to Stories of Love & Longing) as each new appeal was made and finally rejected. In the end, four justices of the Supreme Court were willing to stay their executions: It takes five. (Link to Supreme Court Decision) The Rosenbergs' two sons, Robert and Michael, marched carrying signs reading "Don't Kill My Mommy and Daddy," thousands of Rosenberg supporters paraded on two continents, radio broadcasts were sponsored on their behalf, letters asking for clemency poured into the White House, the Pope asked for mercy. None of it mattered. Julius and Ethel Rosenberg were executed shortly after 8 p.m. in Sing-Sing Prison on June 19, 1953. The first fifty-seven second jolt of electricity failed to kill Ethel. She was restrapped to the chair and given two more jolts before being pronounced dead. Ethel was the first woman executed by the United States Government since Mary Surratt was hanged for her role in the assassination of Abraham Lincoln. In the decades that have followed the Rosenberg trial, whatever lingering doubts remained about Julius's guilt have evaporated as the result of release of the "Venona cables" and information released following the collapse of the Soviet Union. In 1997, Alexsandr Feklisov, Rosenberg's Soviet control came forward to describe his meetings with Julius in the 1940's. Feklisov credited Rosenberg with providing the information necessary for the Soviets to assemble a proximity fuse that would enable them to shoot down an American U2 spy plane in 1960. Feklisov, interviewed for a television documentary, obviously still had warm feelings for the man code-named "Liberal," and appeared outraged at the injustice he felt was perpetrated against Ethel who, insofar as he knew, engaged in no espionage work at all. In September 2008, 91-year-old Martin Sobell finally admitted in an interview with The New York Times that he spied for the Soviet Union. At the same time, newly released grand jury testimony suggested that the Greenglasses may have lied in their trial testimony when they stated that Ethel Rosenberg typed up the secret information provided to the Soviets. In her grand jury testimony, Ruth Greenglass said that she wrote the secret information in longhand-- testimony that is consistent with decoded Soviet cables indicating that the material came to them in longhand form. Sobell told reporters in 2008 that Ethel was guilty only "of being Julius's wife"--though it is certainly likely that she knew about and supported her husband's activities. Sobell's admission caused the Rosenbergs' sons, Robert and Michael Meeropol, to finally concede that their father was a spy. In 2011, Sobell offered additional information about his work with Julius Rosenberg. He told historians Ronald Radosh and Steven Usdin that he spent a frantic weekend in 1948 with Rosenberg, William Perl, and a fourth unidentified man copying on 35-millimeter film secret Air Force documents stolen from a safe at Columbia University. According to Sobell, the film was placed in a box and delivered to Soviet agents on a Long Island Rail platform. Sobell said of his spying, "I did it for the Soviet Union" (and not, it seems, in opposition to fascism). (1) Ronald Radosh and Joyce Milton, The Rosenberg File (1983), p. 67. (4) Id., p. 99. (5) Louis Nizer, The Implosion Conspiracy (1973), p. 1.